When St. Patrick’s Day rolls around each year, everyone wants to be Irish! Also known as the Feast of St. Patrick, this holiday was originally a religious event but it has evolved into a world-wide secular celebration of Irish heritage and culture. 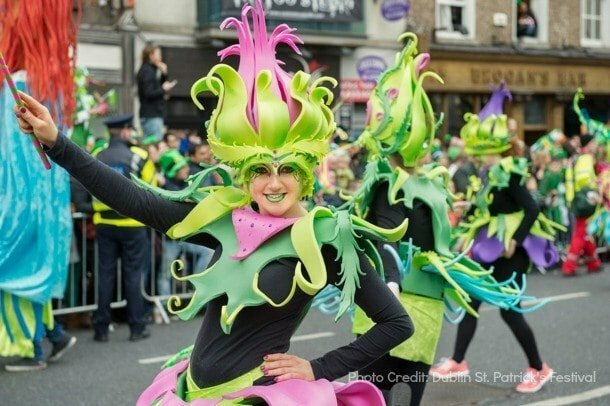 While much of the merry-making on March 17 seems to revolve around drinking pints of green beer in local Irish pubs, there are many family-friendly activities associated with the holiday as well. Check out these St. Patrick’s Day festivals around the world. St. Patrick’s Day Celebrations in the U.S.
For the past couple of years my youngest daughter has been asking to spend St. Patrick’s Day in Ireland and, truth be told, it’s on my travel wish list as well. Each year thousands of tourists travel to Ireland to celebrate in Dublin where the St. Patrick’s Festival takes place over the four to five days leading up to March 17. The highlight of the celebration is the Festival Parade—an exciting and colorful procession through the heart of the city, complete with marching bands and elaborate floats. Many of the tourists in Dublin are there to celebrate in the pubs but there is plenty to do with kids as well. 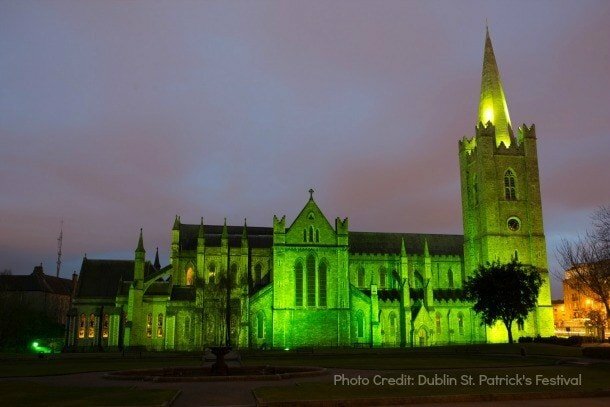 Families can enjoy many of Dublin’s St. Patrick’s Day traditions such as Greening the City, when iconic buildings are lit green in celebration. The festival itself also includes many family-friendly activities such as a treasure hunt around the city, street theater, a fun fair, and workshops in theater and storytelling for children. Boat races on the River Liffey between rival Irish university students entertain all ages. Families can also take part in a In The Footsteps of St. Patrick Walking Tour, which includes entrance to St. Patrick’s Cathedral. Parades on March 17th are the focal point of St. Patrick’s Day celebrations in the U.S. In some more enthusiastic communities, however, festivities last several days. 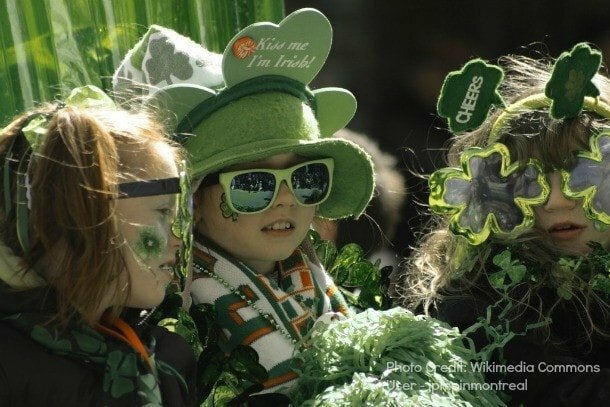 Bear in mind when planning to attend one of the major St. Patrick’s Day parades that crowds may be too rowdy and stressful for families with young children. Crowds may be more manageable at smaller hometown parades. 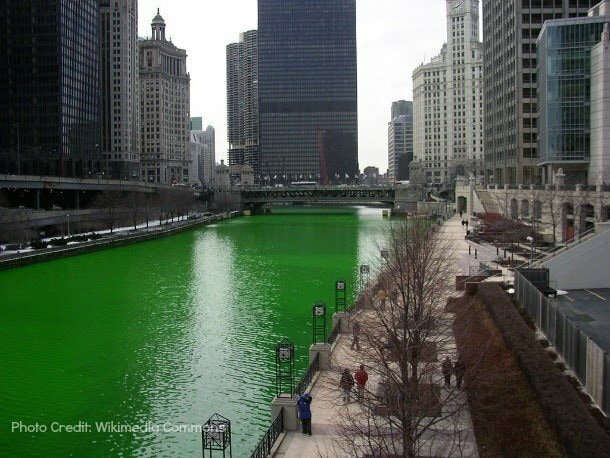 Chicago shows off its Irish heritage every March. For more than 40 years, crowds have gathered to watch as the Chicago River is temporarily dyed emerald green the day before holiday. (A special formula is used that is safe for the environment.) The city has three separate parades but the Downtown Chicago St. Patrick’s Day Parade, one of the biggest in the country, is always held on the Saturday prior to March 17th. Iconic buildings, monuments, and streets are lit up green during the days leading up to St. Patrick’s Day and family-friendly neighborhood festivals are held across the city. The largest St. Patrick’s Day parade in the U.S. (and possibly the world) takes place in New York City and attracts more than 2 million spectators. The NYC St. Patrick’s Day Parade features only marchers instead of floats and is the oldest in the country. It was first marched in 1762. Each of the boroughs also boasts its own parade as well. Families with older kids and teens may enjoy embarking on a themed walking tour to learn more about the history of the Irish in New York; check out tours by the Big Onion and New York City Cultural Walking Tours. 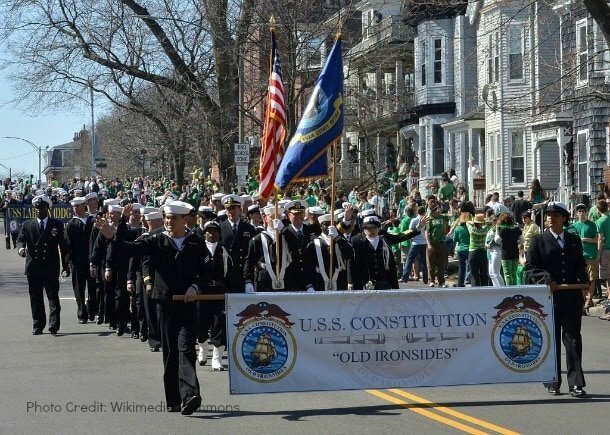 Boston is home to a sizable Irish population and the South Boston St. Patrick’s Day Parade. This parade has taken place every year since 1901 is said to be the second biggest in the U.S., with up to 1 million spectators each year. While in Boston for St. Patrick’s Day, visitors might want to take a stroll along Boston’s Irish Heritage Trail. The 3-mile self-guided tour celebrates the Irish experience in Boston. Irish emigrants, including my own ancestors, who left Ireland for Canada in the middle of the 19th century, brought their St. Patrick’s Day traditions with them as they crossed the seas to settle abroad. 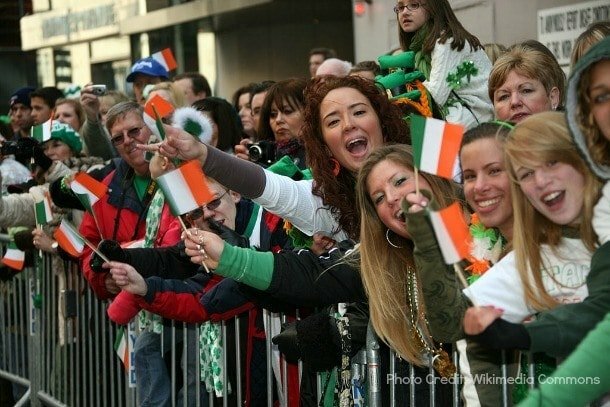 Populous Canadian cities such as Toronto, Montréal, and Vancouver all host St. Patrick’s Day parades and festivals that attract celebrants from all backgrounds. At Niagara Falls on the evening of March 17th, the famous waterfall will be illuminated green in honor of the holiday. St. Patrick’s Day is a provincial holiday in the Canadian provinces of Newfoundland and Labrador—two of the only places outside Ireland where March 17 is a public holiday. Thanks to the Irish diaspora, which now numbers around 70 million, St. Patrick’s Day is celebrated around the world. The most impressive St. Patty’s celebrations are held in the countries with the largest Irish immigrant populations, namely the United States, Great Britain and Canada. Notable festivities also take place in Australia, New Zealand, and Argentina, which is home to an Irish population exceeding 500,000 individuals. Even countries with no substantial Irish populace celebrate this beloved holiday. The good news is that you can celebrate St. Patrick’s Day no matter your heritage or where you are on March 17th. All you need is something green to wear and a bit of Irish spirit! How will you celebrate St. Patrick’s Day this year? Let us know in the comments below! I think its brilliant how St Patricks Day is celebrated so much around the world. I have been in Ireland on the day and would definitely recommend people to be there! It must have been a great experience to be in Ireland for St. Patrick’s Day – I hope we get to do it one day!! And, you need a pint of Guinness, too! I’d love to go to Boston actually for St. Patrick’s Day one of these days. I think I might be the only Irishman that doesn’t enjoy a pint of Guinness! I think Boston would be a great deal of fun too! I’ve always thought it would be a hoot to celebrate St. Patrick’s Day in another country. I haven’t yet though. Had no idea about Newfoundland! I think so too, Jody! We just missed celebrating in London on our recent trip. It had never occurred to me beforehand that the St. Patrick’s Day Parade was on the Sunday before the holiday and I booked theatre tickets for that afternoon. We saw everyone waiting for the parade but we had to miss it! I was in school in Savannah for four years of St. Patrick’s Day. Not sure I need to experience that again. However– I really want to be in Ireland to see how they celebrate, especially outside of Dublin. I’ve heard that Savannah has quite the celebration! I would love to attend the parade in Dublin but I agree that it would be interesting to see how it’s celebrated outside of the city and away from the tourists – more authentic, I presume! Fun! St. Patrick’s Day is not quite this big where I live, so it would be fun to experience the celebration in one of these places! A once-in-a-lifetime experience that everyone should have! Green river is the best!